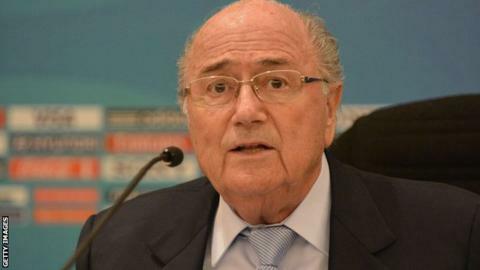 Fifa president Sepp Blatter wants to see more sporting sanctions used in the fight against racism. Blatter, 78, thinks points deductions would have more of an impact than making teams play behind closed doors. "Sporting sanctions are the only effective punishment," he said. "It has to cause the clubs real hurt otherwise nothing will change. "The troublemakers must be punished and it is clear to me that clubs are responsible for the hooligans." Ukraine were ordered by Fifa to play a World Cup qualifier against Poland in an empty stadium after fans made monkey chants and performed Nazi salutes. The punishment was subsequently imposed on the 2018 qualification campaign following an unsuccessful appeal by Ukraine Football Federation. Blatter, in his column for Fifa Weekly, wants "drastic and severe" sanctions for racism but admitted that "football without a crowd is like a concert without sound". He also believes stadium closures "represent a disproportionately collective punishment" and is against excluding innocent fans of opposing teams. Fifa's disciplinary code punishes racism by a warning for a first offence and then more serious sanctions such as stadium closures, points deductions or even expulsion from competitions for further offences.